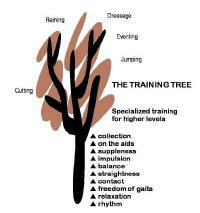 We get halfway up the training tree before we introduce the concept of straightness to the horse. We spend the first months of a horse’s training working on rhythm, relaxation, and freedom of gaits. In this early phase of training, we want him to feel comfortable carrying the weight of a rider. In the second phase of his training, we start to develop the quality of his forward movement. We ask him to accept the contact between the bit and our hand. Toward the end of his first year of training, we put our focus on straightness. Straightness is a pretty easy concept but a lot of people mythunderstand it. It does not mean the direction the horse is moving. Whether he appears to be standing or moving crooked when you look at him is not the point. What straightness means is that the horse’s entire body from nose to tail is in alignment with an imaginary line on the ground. That line might happen to be parallel to a fence or it might be running down the middle of an arena. But a horse can travel “straight” on a circle just as well. In order to travel straight, the horse has to be able use and coordinate the muscles on both sides of his body to an equal degree. All horses are crooked by nature. They all have one side that they prefer to turn on and one side that they don’t. Some people refer to this as a horse having a stiff side and a hollow side. If a horse is stronger on his right side, it’s easier for him to turn to the left so that’s the side he’ll turn to when he’s fleeing from danger and that’s the canter lead he’ll tend to favor. This should be easy to understand because most people aren’t straight, either. People have a dominant side that they prefer to use, too. You learned to write with the hand on that side and you don’t try to change unless you break that arm. There isn’t any reason that you couldn’t write as well with one hand as the other. But, basically because we don’t see any big need for it, we don’t try. The horse sees things the same way. So it’s the trainer’s job to help him work on both sides and develop his muscles evenly. The line you are following on the ground, whether it’s a curved line or a straight line, determines whether the horse is traveling straight. The horse’s right feet move along a track just to the right side of this line and his left feet travel along a track just to the left of it. An easy way to tell if a horse is straight is watch his hind feet to see if they are following in the same track as the front feet. As his hind foot steps forward it should land along the same track as the front foot on that side. When the right hind follows in the track of the right front, the horse is traveling straight on that line at that moment. Staying straight on a curved line is hard for many horses. They tend to travel more crooked in one direction than the other. On a circle, this means that they tend to put their inside hind foot on the line they are traveling instead of on the track just to the right or left of it. This moves their haunches to the outside of the circle. When that happens, they’re cheating. They get out of using their whole circle of muscles, especially the abdominal muscles. They aren’t developing both the carrying muscles and the pushing muscles that they are going to need to compete at the higher levels. So now it’s the trainer’s job now to work on straightness. Circles, serpentines and leg yielding are all good exercises for building the horse’s muscles equally on both sides. Contact has to be there before you can straighten the horse. Remember each hind foot has to follow the track of the front foot on the same side. You can keep putting a horse’s feet back on a track after he moves off of it but you can’t really influence the footfalls so that he doesn’t move off of it in the first place without contact. To influence the horse’s footfalls, you have to be able to feel them. You can always see the front feet. But you can’t see the hind feet. Start out walking on a loopy rein while you try to feel when the hind foot is moving forward. As the hind foot steps forward, you’re going to feel the seat bone on that side drop a little bit. In the beginning, an instructor on the ground can be a big help in learning how to feel when the haunches are drifting off the track. Eventually you’re going to develop a feel for where the horse’s hind feet are. You’re going to feel with your inside seat bone whether the inside hind is stepping straight along the track of the inside front. You have to be able to feel where the hind legs are and where they’re going in order use your aids to ask the horse to move straight. On a circle, for example, you need an independent seat that allows you to apply outside rein and leg in either direction to keep the horse’s haunches from swinging to the outside. As a rider, you’ve probably found out you have one direction you prefer to go, too, whether it be on the left hand or the right hand. You can get your aids better, you can get your seat better or you might have one leg that’s stronger than the other because you tend to use it more. To be a better rider, you’ve got to work on becoming equally strong on both sides. It’s the same basically with the horses. In almost every game they play, they have to do everything in both directions. Dressage tests are a mirror image. Reining horses work mirror image patterns. Cutting horses have to be able to turn as well in one direction as they do in the other. Jumping horses have to be able to make sharp tight turns to take up a line in one direction as well as the other. So basically your job at this level on the training tree is to make your horse even on both sides. I had a wonderful time when i was at the Manor and learned more then i could have ever imagined. It was an unforgettable experience!